NeoDCP Player v2.74 was just released. Read more here. You are here: Home / Features / News / News / NeoDCP Player version 2.74 is out. Read more here. NeoDCP Player version 2.74 is out. Read more here. Not so long after our previous release we are bringing you a new version of NeoDCP Player. We have been asked to add an option to move subtitles vertically and the possibility to manually override colors of subtitles. We weren’t sure about allowing such an intervention into the DCP projection, however our analysis has shown us that there are cinema operators who really need to display subtitles for example on the top of the screen just because they don’t have ascending seats or due to their cinema’s physical characteristics. Each composition (CPL) of a DCP may have different output dimensions. It would make only a little sense to add the option for vertical displacement of subtitles or for overriding subtitles’ color into NeoDCP Player’s general settings. Moreover cinemas very often need to play more CPLs of different aspect ratios one after another. 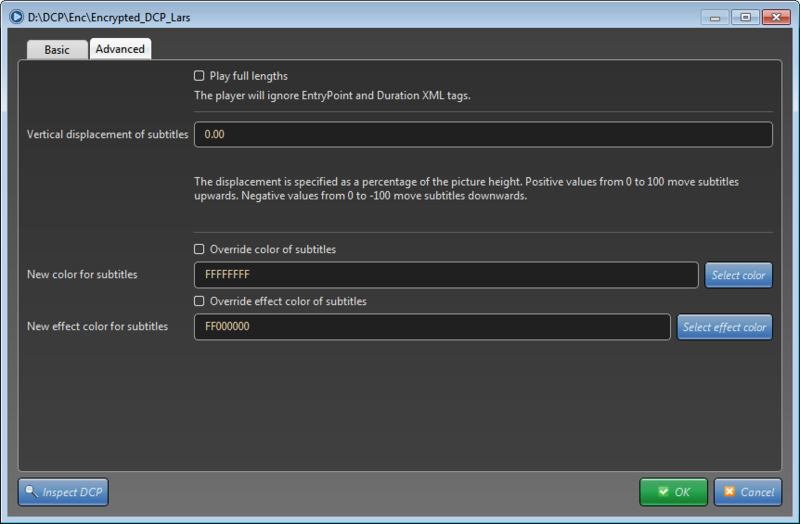 Therefore you may configure the vertical displacement of subtitles and override subtitle colors right after opening a DCP in the Advanced tab or per CPL in the Playlist editor in a similar way. Creating NeoDCP playlist that contains CPLs with customized subtitles color and placement. Select the Assetmap file of your DCP. Click the Advanced tab to show subtitles color override and vertical position settings. Click OK. New CPL will appear in the list. To add more CPLs repeat steps 3 – 8. As soon as your playlist contains the desired content click Save as… button and save your playlist into the a NeoDCP Playlist File (.NEP). To open your newly created playlist file, go to the Files menu, select the Open playlist item and choose your NeoDCP Playlist File (.NEP). If you’re not happy tell us, if you’re happy tell others! https://www.neodcp.com/wp-content/uploads/2015/05/neodcp_v2_74_subtitles.png 348 1002 Neo https://www.neodcp.com/wp-content/uploads/2013/04/logo2_07_2_0.png Neo2015-05-18 17:58:192015-05-19 13:15:17NeoDCP Player version 2.74 is out. Read more here. NeoDCP v2.62 - Several requests from our cinema customers implemented. Click here for release notes. ProtoWay is a software development company with strong experience in IT security and high performance computing algorithms. We work hard to bring you the latest technology products and services. Should you have any questions, contact us here. NeoDCP uses delicious cookies to delight you on this website.